Some book reviews should never be read. But this isn't one of them. This one almost wrote itself. It was easy to write it, because I had so much grief with this box set. So, read on, it will help you decide whether your kid needs to read this popular book set. In the process, you will also feel the agony that Read Aloud Dad felt when considering whether to purchase this 13-book hardcover set. Never before have I racked my brains as much about a book purchase, as in the case of this collection. There were days when I was 100% sure I wanted to buy it and other days when I thought that I couldn't expose my kids to such a collection of dark tales. Back and forth ... forth and back, week in and week out. Until I was ... a complete wreck. There was no way of knowing whether this seemingly depressively-themed mega-selling book set was going to be a hit or a miss one day with my kids, so I simply decided to skip it. Yet, something was eating me. Why the raving reviews from many readers? But even that wasn't the principal cause of my doubt. Another question started swirling through my mind. Why did I find the idea of this dark, moody book set so appealing - even though the principal theme of the stories seemed such a downer? A struggle ensued and soon I knew I would never order this book set. In order to have great happiness you have to have great pain and unhappiness - otherwise how would you know when you're happy? Thinking ahead about my kids reading this book set in some 5-6 years, I wasn't sure about the effect it would have on them. Even if they adored it one day, I wasn't so sure whether that would be good news. I was imagining the day: "Dad, we adore this super-depressive and chilling collection of kidnapping, blackmail and murder stories!" Should a parent be happy? I was imagining myself explaining the situation to my wife: "Honey, at least the kids are reading!" Obviously, every parent would be shouting with excitement if their kid loved a book set with .... take a seat ... 3243 pages, 13 books, enough tongue-in-cheek humour to last an entire year. Plus, author Lemony Snicket frequently explains complex words and metaphors in detail. 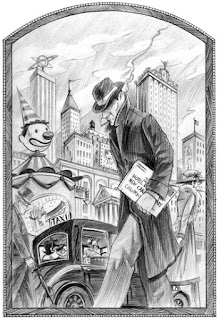 Many reviewers complain that this habit of the author wass overkill, while others loved that he took time to discretely explain complex words he uses to young readers. There is no better way of expanding your vocabulary than learning new words AND their meanings at the same time. "Klaus smiled for an answer and began to read out loud from the book he was holding. "'The Mamba du Mal,'" he read, '"is one of the deadliest snakes in the hemisphere, noted for its strangulatory grip, used in conjunction with its deadly venom, giving all of its victims a tenebrous hue, which is ghastly to behold.'" "Strangulatory? Conjunction? Tenebrous? Hue?" Violet repeated. "I have no idea what you're talking about." "I didn't either," Klaus admitted, "until I looked up some of the words. 'Strangulatory' means 'having to do with strangling.' 'In conjunction' means 'together.' 'Tenebrous' means 'dark.' And 'hue' means 'color.' So the Mamba du Mai is noted for strangling people while it bites them, leaving their corpses dark with bruises." I noticed that I was on the edge of my seat whenever I read any quote or description from the book. It seemed entertaining and good fun. But appearances are one thing. What were we talking about, precisely? Well, this series tracks the troubled lives of three very unlucky children: Violet, Klaus, and Sunny Baudelaire after their parents' demise in an arsonous house fire. The children are now entrusted to the care of their distant cousin Count Olaf, who doesn't wait long before he starts to abuse them and openly plots to embezzle their inheritance. After the Baudelaire trio is removed from his care by their parents' estate executor, the Count begins to doggedly hunt the children down, bringing about the serial slaughter and demise of a multitude of characters. I was having a bad case of mixed feelings. There is a warning with every book. It didn't help. If you have picked up this book with the hope of finding a simple and cheery tale, I'm afraid you have picked up the wrong book altogether. The story may seem cheery at first, when the Baudelaire children spend time in the company of some interesting reptiles and a giddy uncle, but don't be fooled. If you know anything at all about the unlucky Baudelaire children, you already know that even pleasant events lead down the same road to misery. 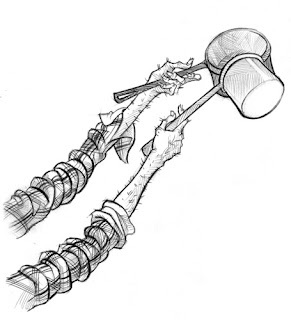 In fact, within the pages you now hold in your hands, the three siblings endure a car accident, a terrible odor, a deadly serpent, a long knife, a large brass reading lamp, and the reappearance of a person they'd hoped never to see again. 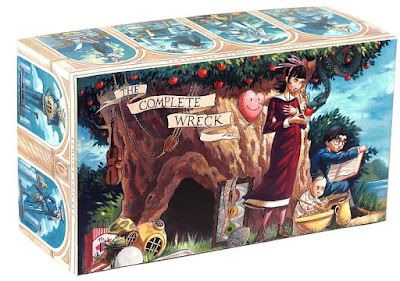 Couple that with the publisher's tagline for the entire book set The Complete Wreck (A Series of Unfortunate Events, Books 1-13): "Some boxes should never be opened. 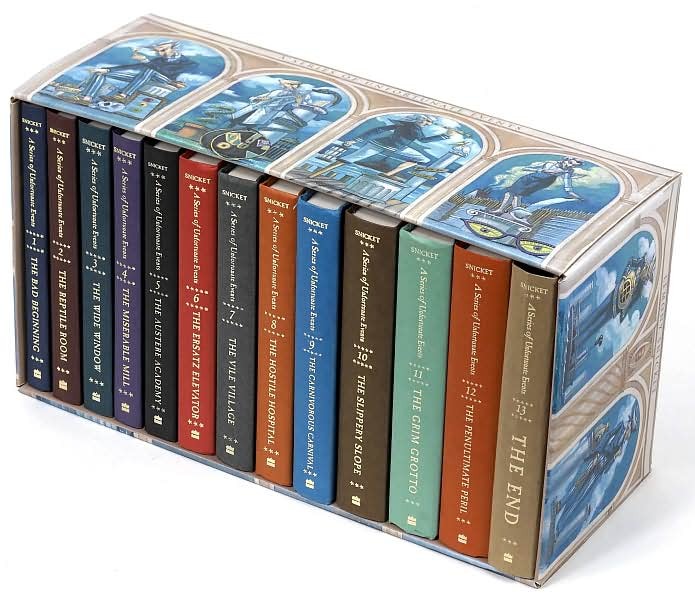 For the first time, the complete A Series of Unfortunate Events – is available in one awful package!". Cool it was, yet we wouldn't be needing it. Too dark. I was putting this book set aside, forever. This depressive dark drama wasn't the stuff I wanted my twins to read when they were 10 years old. There was no real need to expose my kids to such darkness, just because it was a bestselling book set! Finally, I was completely sure that I didn't want to order this book set. Then 40 days later ... BANG. Finally, something managed to reach my brain through my thick skull. 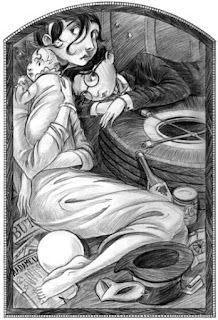 The Complete Wreck (A Series of Unfortunate Events) was exactly what my kids would be needing at that tender age. A light entertaining mix of misery, mishaps, misfortune and tragedy. That's life and that's what they will be wanting to read about. A parent cannot spoonfeed his/her children only with sugary stories about "The Good Life". The Sound of Music is OK, but not every day ... forever. We want our kids to grow, not remain infants. Hence, we need our kids to read about the other side of the positive aspects of life, so that they can value the good even more. If every book I gave my kids to read was about Mahatma Gandhi, they would probably stop reading altogether. Finally, I knew that The Complete Wreck (A Series of Unfortunate Events) would become a proud addition to our home library. This beautiful collection of thirteen books in a huge, elaborately illustrated, shrink–wrapped box was just the perfect dose of dark humour for my twins. Children need books to learn about good and evil. 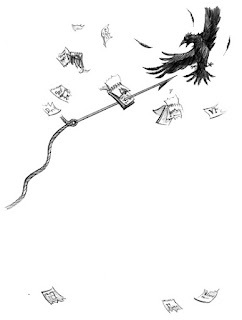 It might as well be from good books with fantastic melancholic illustrations by Brett Helquist. My doubts evaporated - I ordered this book set with a big smile. Finally, I was convinced that I was doing the right thing. There are several additional books that accompany the series, such as The Beatrice Letters, Lemony Snicket: The Unauthorized Autobiography and The Puzzling Puzzles, among others. Instead of a conclusion I leave you with the wise - yet dangerous - words of Lemony Snicket. Cool Paige, thanks for letting us know! A "complete wreck" - now on the Kindle!Do let me know your impressions if you decide to read them! I did find each of the books on the Kindle for $6.99 each. Just thought I'd let you know :). I'm especially happy when someone seeks out the book, based on my recommendation. That is so cool! Please do let me know if you managed to find Lemony Snicket on Kindle (I glanced briefly and could not find it). Also, do let me know your impressions of the book. Thanks for letting me know! Well, your boy knows how to enjoy himself - that's for sure. Glad you will check them out - please do leave your impressions, after you read the series. I'd love to have your opinion! I appreciate your taking the time to leave a comment! My son was a Lemony Snicket fan years ago! I highly recommend these books! Great review. I'll have to check out the series. SU from BF. This comment is pure gold. Loved it! Floored me! Energized me! Surprised me! 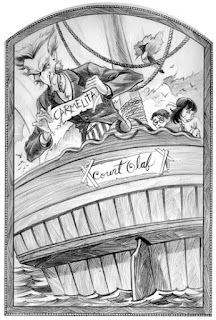 Thanks for taking the time to contribute this fabulous personal take on Lemony Snicket's series! I'm so happy you did. When you said "I also have an AMAZING amount of respect for the kids that "get it" when reading it." - you touch upon a vital point. I feel that inside myself. It's so important. We sometimes act as "book censors" thinking that kids can't get it. They can. And we can also help them to "get it". I love what you said so much! May I quote you .. to you? I was laughing. I loved it. My husband loved it. It was the strangest experience of my life..."
I've been waiting for this one!! I knew you would get around to it at some point! Years ago I picked up the first book in the series with the same goal in mind as I used to when reading children's books at the time: "my students are reading these, I'll be a better teacher if I know where they are coming from." (Note: I no longer require such reasons, I have finally come out of the closet as a full-fledged fan of children's and YA fiction!). The read was an extremely interesting experience for me. I 100%, completely and utterly did not get it. At all. I was convinced that I REQUIRED a happy story for my entertainment. I began to question my life long exposure to the Muppets, Disney and other joyous children's tales... 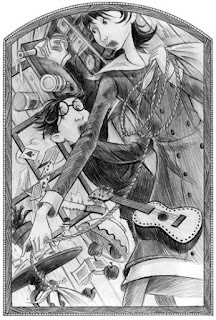 I wondered WHAT THE HECK WAS SO ENTERTAINING ABOUT LEMONY SNICKET??? I finally decided I just didn't like it and I would have to be OK with that. But I wasn't. It bugged me. LIKE CRAZY!! Years passed. My husband (then boyfriend) and I were in library and we were checking out the audiobooks section. There it was - the first book - read by Tim Curry. I was willing to live through the book again just to let my husband experience it so we could talk about it! We took it out and proceeded to do so. I read the book WRONG. I missed the beat. I was on the wrong rhythm. Tim Curry delivered the tale and read it aloud to me in a way that SWEPT ME AWAY. I was, for the first time IN MY LIFE, unable to do that for myself. I'm guessing I was on some sort of reading marathon during a summer vacation when I read it first and trying to consume as much literature as possible. I simply think I did not give the book the time it deserved. We ended up getting the second book on audio as well, but I have never gone back to the print on either (or to continue) to see if I am up to the challenge yet. I think the stories are fabulous now. I also have an AMAZING amount of respect for the kids that "get it" when reading it. Wow, so you are going to embark on "The Complete Wreck" this summer. Cool! Please do tell me how did your kids enjoy the books when you go through them! Love this series. My kids are 8 and I think this would be perfect for this summer! The pictures are p-e-r-f-e-c-t indeed. They are so suggestive and set the mood perfectly for the books. But there is still a certain playfulness about them. Like you - I adore them! Great that they caught your eye as well! I'm sure that JDaniel will love them as he gets older. My kids haven't even seen them yet, but I can't wait to surprise them one day with this fab read-aloud series! We are going to have such fun! JDaniel is too young for these right now. They sound like books we would read together when he gets older. Thanks so much for sharing your own experience Lynette! Wow, what a great read-aloud audience you have there. You are almost an actress on a stage! Narnia is a great choice indeed for kids, even if we as older readers may not be so excited to re-read it for the umpteenth time or even the first time. For kids it is unforgettable. "Why would I deprive them of this experience? Sometimes I find myself getting lost in the story, too, and that's when reading reading aloud to them is the most wonderful for me. " Magic times indeed. The best of times. Explaining things and events from books is so important. Priceless, in fact. That is something that you cannot replace. It makes read-alouds so much more than merely reading aloud. Thanks so much for taking the time to leave your comment! PS Your comment gives me another opportunity to publish a Lemony Snicket quote ... indeed they are fun! Indeed, you have several great points. It's not that the books are not good enough for our 10-year olds. 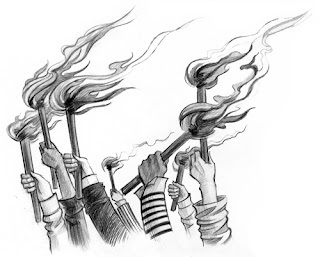 Maybe we - as adults - are a bit too old for the Lemony Snicket books. As you said: " Funny, charming, and great for building vocabulary - I loved these books when I was a bit younger"
Just like you did - I feel the adventure, the excitement - the unpredictability. "A rollicking adventure". That's exactly how I see them today, when I hold them in my hands. I'd love to be ten-year old again, to sit on the "The Complete Wreck" roller coaster! SO glad you opted to read them. Your conclusion is exactly what I tell to parents at the bookstore who are concerned that the books are "too dark" for their little darlings. Not so. 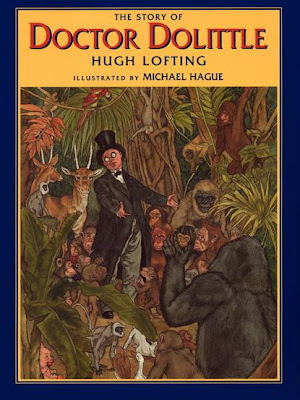 Funny, charming, and great for building vocabulary - I loved these books when I was a bit younger. When I went back and re-read them recently with my younger sisters (10, now, I can't believe it!) I was a little disconcerted at just how ... depressing the series is. But they didn't see any of that. For them, it was a rollicking adventure. I hope your twins get the same. Please tell your son that I would sincerely love to know his opinion of the book. Well, you don't have to tell him that - but it would be cool if one day you could share his experience (positive or negative). My set is standing unused .. so just give me the word..
As I said above to Suzi, I never read children's books "in advance", as I try to save my "first reading" to share with my twins. It's is such a blast to share that "first read aloud" with your kid/kids! That's great news Suzi, I really hope that you will enjoy it. Let me admit, there is a good reason why I have not read the collection. I never read books "in advance" (although I do glance at them), as I try to save my "first reading" to share with my twins. I love the joint experience and the fun that we have reading great books - and I don't want to rob my kids of those magical moments that they share with their dad. So, please, if you do read the first book from The Complete Wreck - leave a comment with your impressions. I really mean it. You would be doing Read Aloud Dad a great favor! I loved the back and forth here. Still have not read these, but you've convinced me to at least try one, eventually. I love book sets and they are easy to loan out and retrieve back because you notice when the book is gone! I read the first one which I also own but my daughters didn't get into them but I think my son might. If he does, I'll ask to borrow yours! What a great point you have here. A fabulous point. "Kids get totally different things out of these types of books than we do as adults". We sometimes forget that we are no longer children. We think we know what they are feeling and thinking. But do we? You said it excellently. We must not forget that kids are the target audience for children's books. Sometimes I am guilty of forgetting. This is a cardinal sin, let us not forget. Sometimes I am guilty of forgetting that sheer excitement is needed to help kids get through thousands and thousands of pages. We want reading to be fun. And sometimes fun is a bit ... well, dangerous and forbidden. Lemony's right, we all trust Jen's Book Page for the best children's book recommendations! escape. Running for your life is another". Very fun reading your thought process on this. I'm sure that you're right, and that your twins will enjoy these books in a few years. I personally enjoyed the first couple and then got bored. But I'm not the target audience, am I? Enjoy! Interesting review! Kids get totally different things out of these types of books than we do as adults. If they love them, they have connected, to something, on some level, in some way that our adult minds can probably not fully comprehend. And if they don't, they will put it down and forget it.